The whole-wheat pitas that I bought earlier in the week have met their delicious demise as vessels for my Chunky Cilantro Hummus. 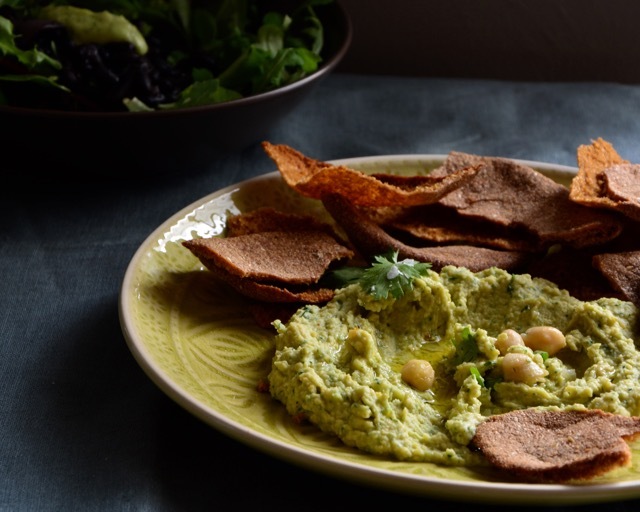 Hummus is so satisfyingly easy to make; just throw everything into the food processor, and— voilà—hummus! As you can see in the photo, today I decided on hummus with more heft and on the chunkier side. Whether you enjoy your hummus creamy or chunky is all up to you—blitz to your heart’s content! Place the drained beans, 2 tablespoons of the reserved bean liquid, tahini, cilantro, lime juice, garlic and ¼ teaspoon of sea salt into a food processor. Process until you have your desired consistency, scrapping down the sides of the bowl with a spatula and adding more of the reserved liquid as necessary. Add more salt according to taste, this is all depending on how salty your canned beans are, and serve at room temperature. I find letting it chill for a few hours helps that flavors blend.